One of the attackers in a still from the movie. A short film about a bus attack during which Muslims protected Christians, while travelling from the Kenyan capital, Nairobi, to Mandera in the north-east, has been nominated for an Oscar, the BBC reports. 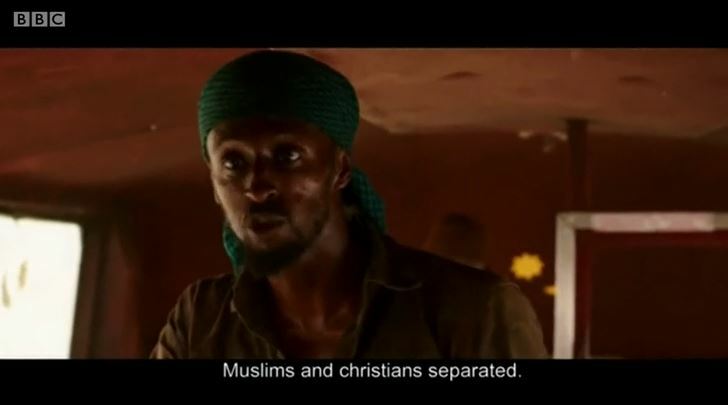 The film, ‘Watu Wote’ (All of us), is one of the five nominees for an award in the best live action short film, and is based on a true story of how Kenyan Muslims defended Christians during an attack by Islamist gunmen on a bus near the Somali border, when two people were killed. The winners in the different categories will be announced during the 90th Academy Awards ceremony, which takes place in Los Angeles on 4 March. Al-Shabaab, an affiliate of Al-Qaeda, has targeted Kenyan Christians for years, attacking churches, public places and buses, especially in coastal areas and along the border with Somalia, where Al-Shabaab originated. This has left behind a trail of pain and destruction, and has instilled fear among regions where Christians are the minority. World Watch Monitor reported in August last year how the militants and their sympathisers are “deeply embedded” in coastal areas of in Lamu and Tana, approximately 700km south-east of Mandera. In one of the most violent attacks in this region, Al-Shabaab militants stormed the university campus in Garissa in April 2015 and slaughtered 147 mostly Christian students. Kenya is number 32 on the recently released Open Doors 2018 World Watch List of 50 countries where it is most difficult to live as a Christian, and in the last couple of years has slowly made its way up the list as violence against Christians has increased.